Facebook is the best advertising around, allowing peers to share and recommend your writing with minimum input from you. These days not having a Facebook page is like denying fans who want to sing your praises the convenience of an online clubhouse. Facebook is incredibly user-friendly, and setting up an author Facebook page should be relatively simple even for those new to the website. While the design changes every six months or so, the steps to set-up a page are usually either kept intact or simplified. The first thing you’ll need is an email address. While you might already have one for personal use, or even one for personal and one for writing, it’ll be easier to manage your social networking from a dedicated email account. Once you have an email address you can sign up to Facebook. There’s no need to open a new account if you already have one, although it will give you the ability to keep your writing and personal lives completely separate. Go to facebook.com and enter the requested details to sign up. Using your personal m, click the cog icon in the upper right of the screen on Facebook’s dark blue toolbar and select ‘create page’. Alternatively, you can click here. Six squares will appear, you want ‘Artist, Band or Public Figure’ so click that. Select ‘Author’ from the drop down menu and enter your pen name. Voila! You’ve created a Facebook page for use as an author. You can switch between your personal account and your author page using the cog icon’s drop down menu, under the option ‘Use Facebook as’. Facebook frequently change the layout of their pages but one thing that has remained consistent is the use of profile pictures. Your page, or ‘profile’, will feature a 160x160px size photograph in the top left, taking pride of place. This photograph will appear next to any comments you make on the site, reduced to about 32x32px. It’s up to you whether you use a picture of you, a picture of one of your books or some other imagery that you feel communicates what you’re about as an author. Remember that at 32x32px, detail doesn’t count for much, so you should try to choose something with a recognizable style or coloring. Refer to our article on Fantastic Author Photos for some ideas. J.K. Rowling and Stieg Larsson both have close-up photos as their profile pictures, meaning they are easily recognizable in both 160x160px and 32x32px forms. Before you have a profile picture there will be a large square with an ‘Add profile picture’ button on top. Clicking this will allow you to upload a picture from your computer. Facebook currently allows a cover photo, a 851x315px background image on top of which your profile picture appears. These are only visible to people already on your page and may be partially obscured depending on how someone is looking at your page. While the profile picture is a vital part of your profile, establishing your brand and making you more recognizable online, the cover photo is generally used more for decoration. Both can be changed at your discretion. A nice way of utilizing the cover photo space for more than just decoration is to include a call to action, encouraging people to click on it. This will bring up the image with the description on the right hand side. By including a link in the description you can advertise something such as a giveaway or a new book. The ‘about’ section under your profile picture and name can be altered by clicking on it or by clicking the ‘update page info’ button. The biography is the same information you would use for any self-promotion: a short personal history, perhaps including education or career highlights, the type of fiction you write and the work you have published. See our article on the 6 essential features of a fiction writer’s website for tips on writing the online bio. to both you and anyone looking at your page. If you’re using a personal email account you can have Facebook send notifications to your contacts, inviting them to like your page. Advertising your page on Twitter is a good idea. Social media is at a point where as soon as people hear about you they’ll assume you have a fan page on Facebook. 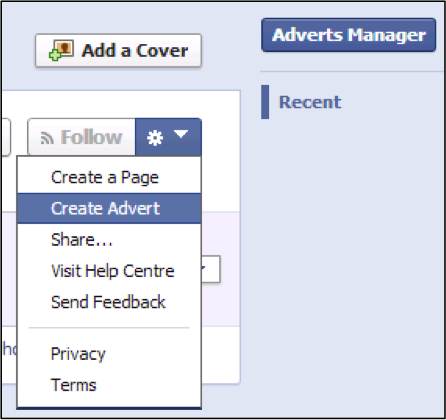 You can also add ‘like’ buttons to other websites, allowing an instant connection to your Facebook page. Clicking here will allow you to adjust the appearance of the button, and decide on the page you want the button to apply to. Once you’ve made your choices you’ll be given a code which you can include on any website, creating a ‘Like Button’. Clicking this button will allow fans to ‘like’ your page, even if they’re not using Facebook at the time. You can also advertise your page, paying a small fee to design an advert which will appear on Facebook to an audience of your choice (size and targeting being the main determiners of the fee). This can be done by clicking the large, blue ‘Advert Manager’ button or the ‘Create Advert’ button which is part of a drop down menu summoned by clicking the cog icon. Of course, to be worth liking you’ve got to give your audience something. You can post statuses, links to online content, pictures and videos straight to your page. Anyone who likes your page will have these appear on their newsfeed (a Facebook feature which displays relevant posts to members) and anyone looking to see if you’re worth liking will find a wealth of content. But your content needs to stay relevant. Fans interact with you as an author and that’s the side of you they want to see explored. Mitch Albom lavishes his fans with relevant Facebook content, from photos of book signings and stylized quotes from his books, to video interviews and news about upcoming events. His page can be found here. Fans can individually ‘like’ your posts and, depending on the settings you choose, leave comments under them. Relevant, interesting content is what will get you likes. 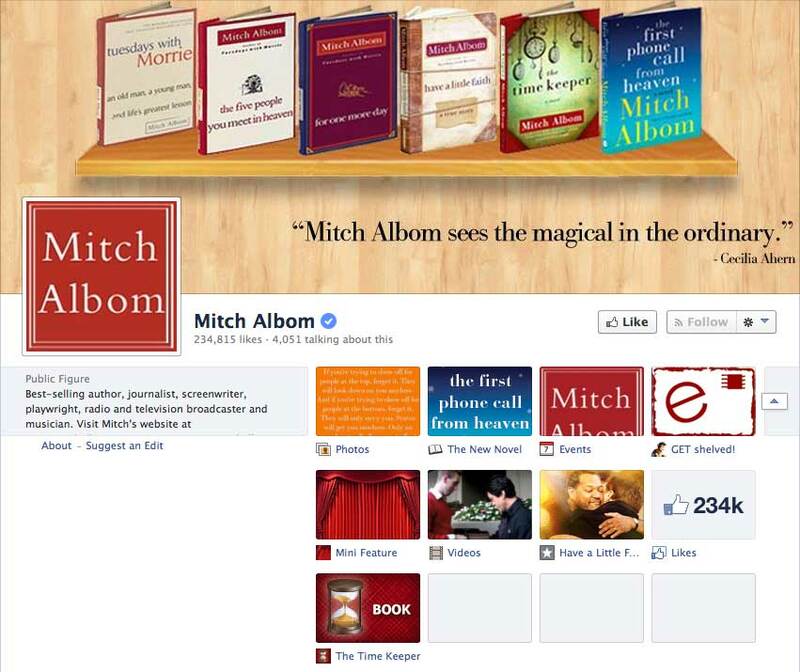 Having created your author’s fan page, should you also create fan pages for your books? Some worry that they will divide their fans and make it harder to manage their social media. The truth is that creating a fan page is so easy that the question isn’t ‘should there be a fan page?’ it’s ‘should I be the one to control it?’ Eventually someone will set up a page and then it’s out of your control. You can try and start an ‘official’ page afterwards but then you are splitting your fan base. If you control both book and author pages then you can cross advertise, ensuring that the audience of one page knows there’s another. Another helpful feature is that anyone adding your book to the list of things they’ve read, a practice which has recently grown in popularity, will be linked to the book’s Facebook page. Your name will also appear underneath, in case they love the book but don’t yet know much about you as an author. If you follow these steps you’ll soon have an Author’s Facebook page you can be proud of. The next step is to build your audience by producing high quality content at a reliable pace. Our article on producing social media content will guide you on your way to the kind of content that people enjoy and share with their friends. You can also sign up for our free Social Media dashboard for authors to help research content to post and to schedule your posts in advance. Facebook is designed for usability so if you follow the stages above and explore a little, you’ll be a master in no time.